The concept of profiting off of caricature as entertainment is as old as theatre itself. Like the theatre, our society and members of it perform onstage as idealized manifestations of life while backstage the reality of life grinds us down and binds us in the search for our stories. 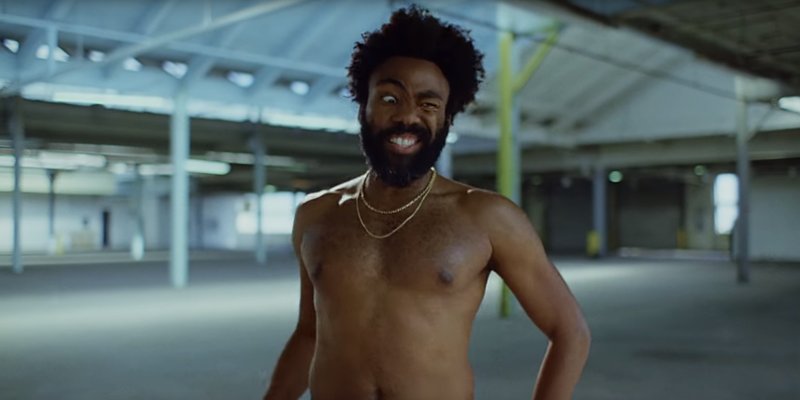 Donald Glover as Childish Gambino presents audiences with a stage where the curtain is drawn during the entire performance in his latest music video for the song “This is America” (TIA). If you haven’t seen it yet, we’ve attached it at the end of this article for your convenience. We witness him run through a gamut of exaggerated facial expressions and body movements while the carcass of a slain black man is unceremoniously hauled out of frame as the gun is diligently carried away with reverence. A celebrating choral group is slain with an assault weapon in front of a police cruiser while the shooter confidently strolls away from the scene. Flaming vehicles, crowds running into one another from every direction, galloping horses, and masked individuals with cell phones drawn record the choreographed disarray surrounding Childish Gambino. He and his dance troupe of conservatively dressed black students draw our attention to the foreground while backstage the veracity of life in America for black women and men is turned into space to fill time slots on entertainment-media outlets. Gambino pulls no punches in drawing the curtain between onstage entertainment and backstage reality. Art as a reflection of real human experience is rarely profitable for those with the checkbook necessary to reach audiences on the scale Childish has accomplished this past weekend. His stage for “TIA” is deceivingly simple while his story is musically articulated through a byzantine of joyful church choirs feeding into deep, menacing reverberations mixed with whistles, sirens, and gunshots. Tone shifts brilliantly from distress to elation as his global audience dances in the spectrum of our shared narrative controlled by those profiting off both tragedy and party. Resolutely showing us the truth with unflinching verbal precision, Gambino gives voice to the paradox of American culture and entertainment, our chief export to the world, being born from the creativity and traditions of marginalized black communities. This is America, where fear is franchised and the disenfranchised become commodities for entertainment and profit. In our pursuit of providing a better life for our children, we are led to believe determination, education, creativity, work ethic, and confidence will lead to sustainable careers within a healthy lifestyle. While this onstage idealization of American values is true for a select echelon of society, backstage the reality of what these values entail is embroiled with the contradiction that African Americans must work harder for less and risk their unique cultural identity for the revenue of those who control our societal narrative. Childish Gambino acknowledges an American stage rife with grief, celebration, pain, parades, parties, and profits while as he calls for each of us to join him in tearing down the curtain to regain control of our own respective narratives together. You go tell somebody, because This is America. If you haven’t heard of David Bowie’s I’m Afraid Of Americans, we can’t blame you. 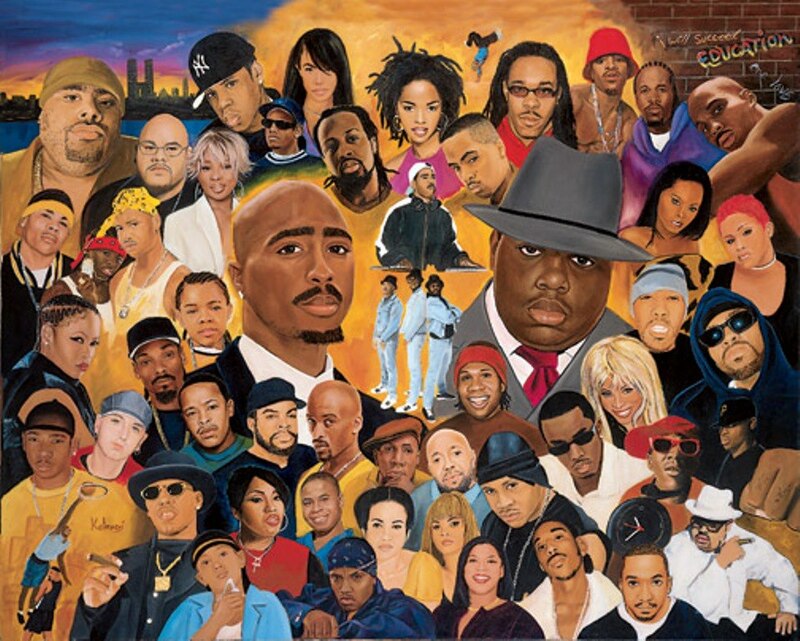 It was released over two decades ago and only boasts just shy of 2 million views on YouTube. However, it does remain culturally relevant–particularly in light of yesterday’s big release by Childish Gambino. The contrast with David Bowie’s I’m Afraid Of Americans is a poignant one, and possibly cruel to Bowie’s memory. In his music video also starring Trent Reznor of Nine Inch Nails, he was pursued relentlessly through an alien landscape of Manhattan by a white man while finding no succor in the passersby. Witnessing scenes of black violence that offer no safe harbor in his flight, seeing scorn for police, all while Trent Reznor portrays a dogmatic rage that will not let him be. The similarities in narratives are striking and frequent. At times, we see both fleeing essentially faceless interlocutors in what might otherwise be a healthy and regular enjoyment of life. 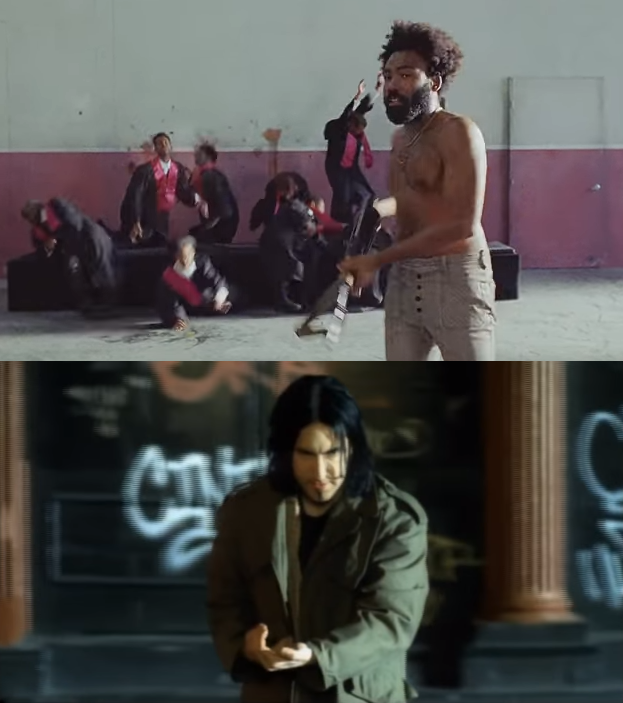 At others, we see the doctrine of gun worship in full effect: in This Is America, Gambino is the firearm wielding aggressor, while Reznor plays it in Bowie’s video. 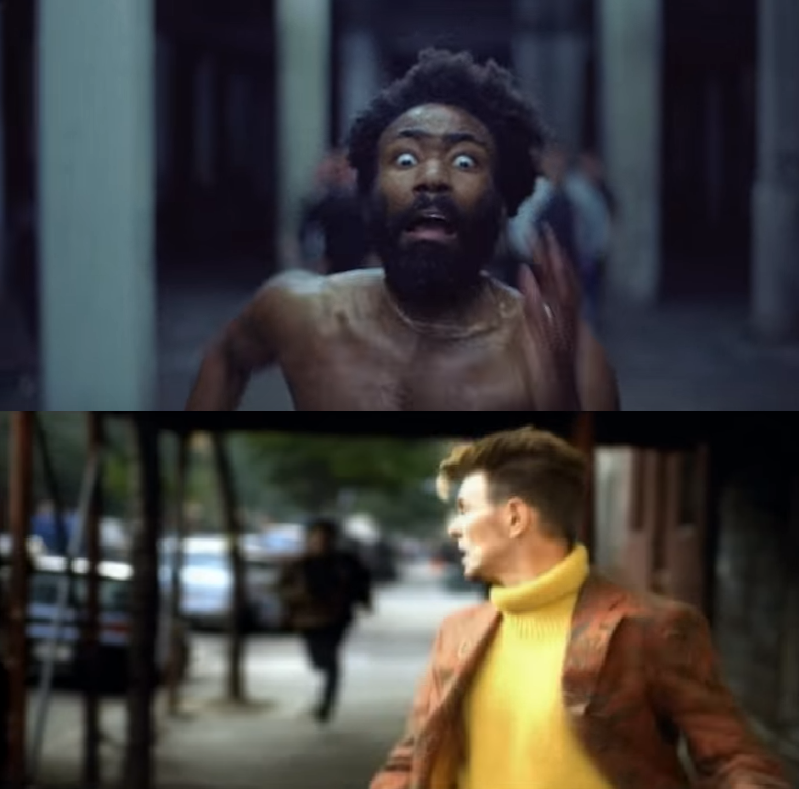 It would be reaching to declare Gambino’s effort derivative; after all, it is doubtful that Bowie experienced much hardship as a white superstar during any of his time State-side. However, it should not be overlooked that even his exterior perspective over 20 years ago was imbued with extreme relevancy to what is still happening every day here. The culture of fear and aggression that is fed by an uncaring machine of daytime demagogues all but assures that nothing can change. Like peeling an onion, parsing through the layers of Gambino’s latest musical diatribe on culture in the States is a necessary bitter pill if you’re trying to prepare a righteous meal. Context is everything here, and there’s no scarcity of it in how Black culture is being exhibited in a grotesque parade these days. One wonders what the media would do with itself if it didn’t have racial tensions to inflame at least once a news cycle. One also wonders what TV viewers would do with themselves if they didn’t have it to tune into. Maybe take a community college class on tolerance?